This 16" x 48" at 10epi (ends per inch), tapestry is woven vertically, but the scene is sideways. So view this taco style! weft (horizontal). Therefore shapes are built up like individual bricks, one on top of the other, not all the way across. 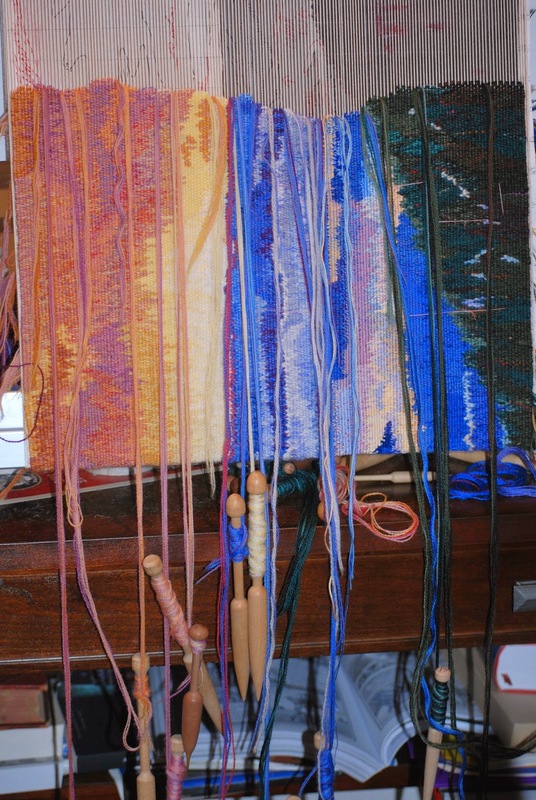 For the month of January, I wove 32 hours, only 96 hours to complete the weaving! I moved the bobbins out of the way for this picture. An American Tapestry Alliance sponsored show. Patti your work is stunning. So fun just like your sketched. Man you have to have patience to do that. Amazing! Stunning and amazing. I am bowing low with appreciation. Awesomeness! Similar to tennis, I like to practice.